It was an unusual first question: "How long have you been doing this?" After being in complete awe of his work, within minutes, it's the only thing that came to mind. He smiled, then almost laughed and said, "Many lives." At the time, I didn't know Kanti-kaka had received the highest honor in India -- Padmashree -- as a sculptor or that his 15 foot carvings were anonymously placed in places like Union Square, or that he had lived with the likes of Mahatma Gandhi and Vinoba Bhave. All I knew was that I was standing in front of a simple, 80 year old saint, from whom I had much to learn. To see inspiration, you first have to open your eyes. So we walk 2 hours to meet Kanti-kaka, as is now our habit. Journey people that we are, we also don't take any appointments; if it's meant to be, it will be. And today was meant to be. We walk into a simple home, with abundant chikoo trees and about two dozen peacocks freely roaming under them. Kanti-kaka's wife passed away many years ago and he had no kids, so he stayed with his sister in a simple home with an adjoining warehouse that served as his workshop. First thing you notice is the strikingly high ceiling. Almost immediately after that, you see the 15 foot statues, lined up one after another ... each with its own unique expression. And then, you feel a deep sense of peace. A thin, frail man with bright eyes, slowly walks up to us and greets us. Very quickly, we start sharing stories. 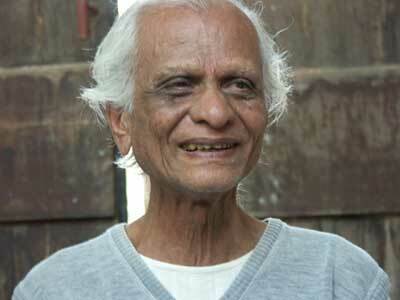 From meditation to spirituality to anecdotes with legendary souls, Kanti-kaka is solid, inside and out. It's obvious why this man carries such a strong presence. "If a child asks you, what's the purpose of life, what would you," I'm cut off as Kanti-kaka retorts: "Purpose is in the future. Why do you need a purpose? Whatever is in front of you is your purpose." "You see, there's a story from the Upanishads. A young man comes back from college, thinking he knows it all. His father tells him to find a branch of a Banyan tree and find that tree's source. The son brings back a seed. The father then asks him to break open the seed and find its source. The son declares, 'There's nothing.' 'Well, son, it is from that nothing that everything has emerged. If you don't know that nothing, you don't know anything,' the Dad concludes." All of us share a nice laugh. "You have spent time with so many saints, so many have visited you, you have worked with so many others. Who have you benefited most from?" I asked. "There are many gurus, but very few sad-gurus. What all sad-gurus point to is your ultimate teacher -- your own soul." I really felt like he was reflecting what was on my mind. So I keep on firing questions: "You have a meditation room. Do you meditate?" With a sagely yet innocent look, he says, "Yes, I love to meditate. I sit in silence 30-40 minutes everyday. But whenever you meditate, you have already made a compartment about what is non-meditation. Meditation has to be a constant stream for 24 hours. Real test of meditation is how you handle your life situations. If you have preferences, and you cannot accept life as it comes, you aren't meditating." Clearly, to me, this man is speaking dharma. Then Kanti-kaka describes a time when he travelled all the way to New York, only to be denied entry. He sat there for almost 18 hours at the airport, in the same spot. Eventually, he had to return back to India. Turns out, it was an error on their part. "Whatever the case, you have to have the ability to be still, to be able to tell yourself to sit down and be quiet," he added. Anandamayi Ma, a famous India saint with millions of followers, comes to Kanti-kaka's house to find that 'quiet'. "Whenver I need peace, I will come here," she told him once. There's nothing special about the place, except that it's Kanti-kaka's lab. Every piece is an act of worship, an expression of his soul. Although he was tempted once, none of his work bears his name. He has no benefactors; everything, every single thing, he owns will be donated to the country after his death. Before we left, I had to ask him the big-A question. "Kaka, what advice would you have for us?" He laughs, "Advice? I have no advice. How can I give advice? You have find your own answers, within the depths of your own soul. It's all there, waiting to be discovered." There it is. Everything about Kaka's humility, wisdom, and dignity is summed up in one response. "Kaka, we had better go. You must be getting tired." With an ever-true smile, he concludes: "A stream never gets tired of flowing." For a few moments, we got to be in that flow too.